Court paperwork reveals the disturbing scene police officers found at a Phoenix cockfighting ring. 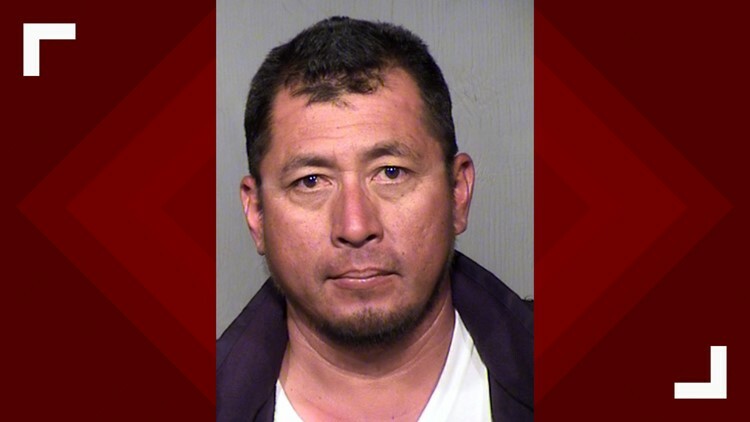 PHOENIX — A Maricopa man is being charged on at least 40 counts of cockfighting after officers with the Phoenix Police Department busted a cockfighting ring Sunday morning. According to court documents, 70 roosters were found at the scene near 27th Avenue and Buckeye Road. Officers observed trailers with cages holding some of the chickens, a 15 by 15 feet ring made out of plywood and table with syringes, talon covers, red string and ties on it. Court documents also reveal there was a cage with several young chicks still with their down feathers, two adult pit bulls in cages with no food, one peacock, a duck and a rabbit. Officers were first called to the property by a neighbor worried about someone injured next door. The police department said people inside the house began running and jumping fences when the officers arrived. There were 17 cars parked on the property, according to court documents. Police were able to confront 50-year-old Robin Arreaga who said he rents the property where the fighting was taken place. Robin Arreaga is being charged on dozens of counts of cockfighting after the Phoenix Police Department busted a cockfighting ring at his property. Arreaga appeared in the Fourth Avenue Jail courtroom and was released on his own recognizance. In video of his appearance, a commissioner is heard saying Arreaga is being charged on 70 counts of cockfighting but the court paperwork lists only 40. 12 News has reached out for clarification and will update when we hear back. The Phoenix Police Department, along with the Arizona Humane Society, will continue to investigate the incident.